Specialist drug and alcohol services for young people – a cost benefit analysis. [UK] Department for Education, 2011. Study published by UK government estimates that every £1 spent on specialist substance misuse treatment for under-18s in Britain averts social costs totalling £4.66–£8.38. Summary This report looks at the costs and benefits associated with young people's drug and alcohol treatment. About 24,000 young people received specialist drug and alcohol treatment in the UK in 2008–09. This is defined as "a care planned medical, psychosocial or specialist harm reduction intervention". As set out in the Drug Strategy 2010, such treatment is aimed at preventing escalation of use or harm and should "respond incrementally to the risks in terms of drug use, vulnerability and, particularly, age". Most of these young people were treated primarily for alcohol (37%) or cannabis (53%) misuse, with the remaining 10% misusing drugs in class A of the Misuse of Drugs Act, including heroin and crack. They had also experienced a range of other problems, including involvement in crime (shoplifting, theft, assault); being NEET (not in education, employment or training); or housing problems. The National Treatment Agency (NTA) has oversight of young people's specialist substance misuse services and systematically collects information on young people accessing them. This information includes data on young people's characteristics and, for most 16- and 17-year-olds, a range of outcomes comparing treatment start and exit (such as crime, health, housing and education). We have drawn on this data and the evidence from a range of academic studies and policy reports to assess the cost-effectiveness of young people's specialist drug and alcohol treatment in the UK. Throughout the report the term 'young people' is taken to refer to those aged under 18 unless stated otherwise. However, much of the evidence base applies to those aged 16 or 17. • Costs Understanding the amount spent in total and per person on specialist drug and alcohol services for young people in 2008–09. • Benefits Estimating and valuing the benefits of young people's drug and alcohol treatment – measured as a reduction in the economic and social costs of drug and alcohol misuse. • Long-term costs Costs incurred if young substance misusers become problematic drug users (PDUs) or problematic alcohol users as adults. If this happens, the costs imposed on society are likely to increase further as adult PDUs and problematic alcohol users tend to commit more frequent and serious crimes, impose higher costs on the NHS, are more likely to die prematurely and have high unemployment rates. Finally, those young people who do not become PDUs or problematic alcohol users as adults might still incur long-term costs. Indeed, young substance misusers are more likely to be NEET (not in education, employment or training) and leave school without qualifications. This too has a cost, in terms of lower wages and poorer employment prospects. We rely on (NTA) data from the National Drug Treatment Monitoring System (NDTMS) and the associated Treatment Outcomes Profile data (TOP) and a range of academic studies and policy reports to estimate these counterfactual costs. We estimate that the immediate counterfactual cost of crime committed by young people misusing drugs and alcohol is just under £100m per year. This equates to an annual cost of crime per young drug and alcohol user of around £4000 per person per year in the absence of treatment. These costs appear to be driven by a relatively few young people misusing drugs or alcohol, with most reporting no offending. The annual counterfactual health care cost is around £4.3m per year, or £179 per person per year. Within this, the counterfactual cost of drug and alcohol-related death accounts for £4.2m per year; the remainder is the cost of drug and alcohol-related illness. • adult non-problematic drug use (non-PDU). It is likely that young people's substance misuse contributes to further costs, including those associated with children's services, and particularly the costs of being taken into care. 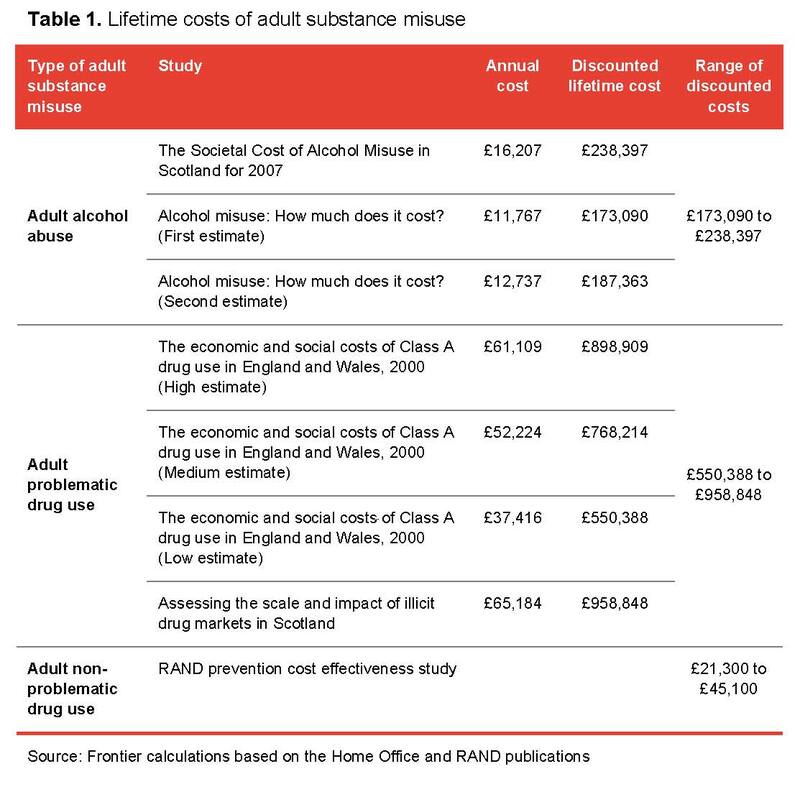 However, it was not possible to isolate the proportion of these costs attributable to substance misuse, so these were not factored into the overall cost figures. Throughout the report we have taken a cautious approach to constructing cost and benefit figures to ensure that the final calculations provide a robust lower estimate of any projected savings. In Table 1 we summarise the costs associated with adult substance misuse; these are the costs of crime, poor health, premature death and lost output due to absenteeism and low employment levels. These costs are high and vary between £21,300–£45,100 per year for non-problematic adult drug users, £173,090–£238,397 per year for adult alcohol abusers, and £550,388–£958,848 per year The cost estimates reported for adult problematic drug users are broadly consistent with previous estimates made by NICE, and subsequently adopted by the NTA in their recent analysis of the value for money of adult drug treatment. In particular, these studies estimate a lifetime crime cost of £445,000 for an injecting drug user, and a lifetime health cost of £35,000. Although at the lower end of our estimates of the lifetime cost of an adult PDU, these studies do not include costs such as lower productivity or other lost output and are therefore broadly in line with the estimates shown here. for problematic adult drug users. However, not all young substance misusers will become problematic adult substance users, or experience other wider problems, even if not treated. Studies suggest that between 30% and 40% of moderate/heavy teenage alcohol and cannabis users would develop drug/alcohol misuse problems as adults while the remaining 60%–70% would experience natural remission (even if not treated). The proportion is however higher for teenage class A Of the Misuse of Drugs Act including heroin and cocaine. drug users (up to 95% of teenage class A drug users continue to use drugs in adulthood). 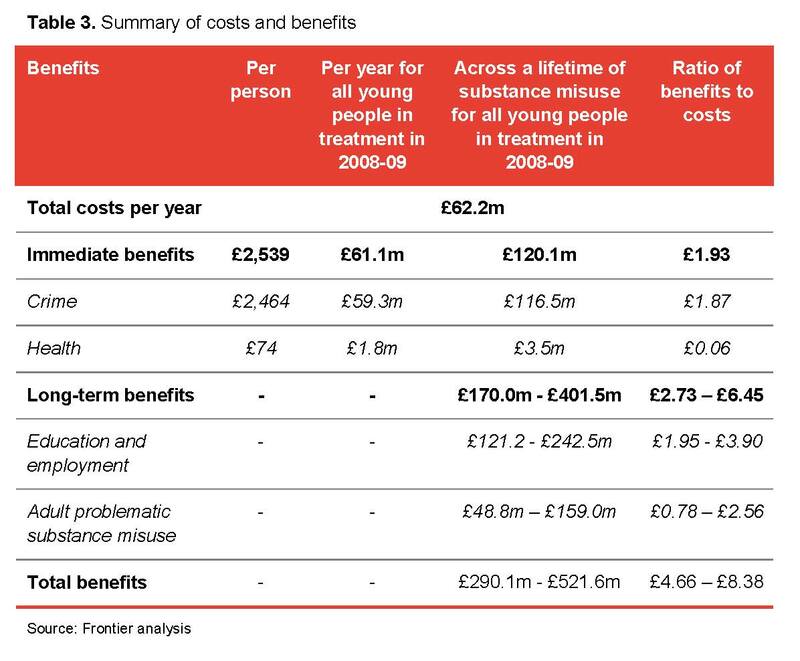 We combine the lifetime costs of adult substance misuse with the probabilities that young people currently in treatment would have become adult problematic and non-problematic drug users in the absence of treatment. The results of the counterfactual cost calculations are presented in Table 2. It is worth noting that these average costs are lower than the unit costs of being a PDU or a problematic alcohol user. This is because some young people (between 56% and 64% of the sample) are expected to experience natural remission (ie, reduce or halt their drug or alcohol use as they move out of adolescence) and, therefore, not incur these costs in the future. In addition, 17.5% of the sample are expected to become non-PDUs (if not treated), with the costs of non-PDU being somewhat lower – between £21,300 and £45,100 over a 20-year period. The final element of long-term counterfactual costs that we have considered is the cost associated with being NEET. This leads to poorer educational attainment and labour market outcomes in later life. Recent academic literature has valued the lifetime cost of educational underachievement and poor employment prospects at between £92,000 and £356,000 per person, expressed as a net present value. The net present value (NPV) is the total value now of a stream of future costs and benefits. The value of each future cost or benefit is discounted, as the value of a payment made in a future period is lower than if the same nominal amount had been paid in the current period. After the counterfactual costs are established, we can estimate the benefits of treatment. As a result of treatment, most young people reduce their drug and alcohol consumption, commit fewer crimes and report improved wellbeing. The likelihood of their becoming PDUs or problematic alcohol users as adults also decreases. Therefore, some of the costs that these young people would have imposed on society if not treated are now averted. We estimate these reductions in the counterfactual costs (ie, the benefits of treatment) and compare them against the cost of treatment. Throughout this report, all of the immediate and long-term counterfactual costs and future benefits have been appropriately discounted, and are reported in terms of their net present value. Our findings are discussed in detail below. The total amount spent on local services for young substance misusers in 2008–09 was £62.2m. Around 40% of this funding came from the Young Person's Pooled Treatment Budget. The remainder was provided through Area Based Grants, Home Office funding for youth offending teams or youth justice board spending via the secure estate. It is not possible to entirely distinguish between funding that is allocated for drug and alcohol treatment and funding that is allocated to provide drug information and preventative advice. However, despite these limitations, we believe that the figure of £62.2m is a good estimate of the total cost of providing treatment services for young people in 2008–09. Both the immediate and long-term benefits of treatment describe the economic and social costs that are avoided as a result of getting people into specialist drug and alcohol treatment. The immediate benefits of treatment are lower levels of drug and alcohol related crime, and fewer drug and alcohol related inpatient admissions and deaths. The long-term benefits of treatment are a lower likelihood (and therefore lower expected cost) of young people developing substance misuse problems as adults, and improved educational attainment and labour market outcomes. Data provided by the NTA indicates that the potential immediate benefit of drug and alcohol treatment could be up to a 55–65% reduction in offending by young people receiving treatment. This equates to a £59.3m net annual saving as a result of treatment. Our analysis also shows around a 40% drop in the estimated number of drug and alcohol-related deaths and hospital admissions post-treatment. This equates to a benefit of around £1.8m per year in terms of the NHS and wider social costs that can be avoided. The immediate benefit from reduced crime alone appears to be sufficiently large to suggest a positive net benefit of drug and alcohol treatment for young people. Even assuming no long-term benefits or immediate health benefits, we calculate that in order for young people's treatment to be cost-effective, the required reduction in the immediate amount of crime committed by young people is just 32%. It should be noted that the proportion of young people in treatment who are offending appears to be low. However, these rates probably underreport levels of offending as young people may be reluctant to admit to offending behaviour. In addition, those who do offend appear to be fairly prolific, contributing to the costs identified within this report. By treatment exit, the amount of self-reported offending committed by young people has fallen on average by 55–65%. Unlike the immediate benefits of treatment, the long-term benefits are very difficult to assess. The NDTMS/TOP data includes information on a range of outcomes immediately after treatment, such as substance use, education, employment, crime and health. These immediate impacts, however, cannot easily be 'translated' into long-term effects. • 17% for cannabis users. Compared to long-term substance misuse rates expected without treatment (37%–44%), treatment is effective for many young people. That is to say that many young people who would otherwise be expected to escalate their drug or alcohol use and develop further problems appear to have effectively reduced or halted their misuse for up to four years after treatment (judged by NTA re-presentation data). However, we need to exercise caution when using these re-presentation rates as a proxy for the treatment's effectiveness. This is because some young people may relapse after the period covered by the re-presentation data. Others may have developed problematic drug or alcohol use again, but without re-accessing treatment. Therefore, in our hypothetical scenarios below, we adopt a conservative approach and use slightly lower effectiveness rates – 7% and 10% – than the four-year re-presentation rates of 20% reported by the NTA. • a 10% reduction in the number of young people who are likely to become adult substance misusers in their lifetime would generate £48.8 million–£159.0 million net benefits. If these reductions (7%–10%) are achieved, the long-term net benefits of treatment would be high – up to £159 million. To estimate the long-term benefits of improved educational outcomes, we have modelled the effect of treatment on the proportion of young people who are not in education, employment in training. When entering treatment, 45% of young people in our sample are NEET, compared to 9% of the wider population. Data from the NTA however indicates that treatment could potentially reduce the proportion of young people that are NEET by 6.5%. Using estimates of the lifetime cost of being NEET, a 6.5% reduction in the proportion who are NEET leads to a total lifetime benefit for young people in our sample of £159m, equivalent to £6590 per person. If the reduction in the NEET percentage was just 5%, this would still lead to significant benefits totalling £121m. On the other hand, a 10% reduction in the NEET percentage would generate £242m of benefits, more than £10,080 per person. This only takes into account changes in NEET status by the time of treatment exit. It does not include any impact of treatment in supporting young people to be ready for employment or education and may therefore underestimate the benefits of treatment in this area. We sought to assess the costs faced by wider children's services, including costs of children being taken into care. However, it is difficult to identify the proportion of such costs that could be directly attributed to young people's substance misuse. As such, and in the interests of robust estimates, we have not included such costs within this analysis. Table 3 summarises our results and brings together both estimates of immediate and long-term benefits. All of the immediate and long-term benefits in this report have been appropriately discounted and are expressed in NPV terms. Throughout this report, we highlight several key limitations of our analysis, particularly relating to the practical or conceptual difficulties in identifying and quantifying the benefits associated with young people's drug treatment. However, despite these limitations, our results provide a robust yet conservative estimate of the benefit of young people's drug treatment. In particular, the results shown in Table 3 are robust to changes in the assumptions surrounding both the immediate and long-term benefits of treatment. When compiling figures we have tended to use the upper estimate of costs associated with treatment and the lower estimate of any benefits. Finally, to the extent we have been unable to capture certain benefits in our analysis, our results again represent a conservative estimate of total benefits. Overall, the study has shown that the immediate and long-term benefits of specialist substance misuse treatment for young people are likely to significantly outweigh the cost of providing this treatment. In particular, we have estimated a benefit of £4.66–£8.38 for every £1 spent on young people's drug and alcohol treatment. Furthermore, our central case estimates are based on a conservative set of assumptions. Therefore, the benefit of specialist drug and alcohol treatment for young people may be larger than we report here.